Almond pulp and oatmeal facial scrub are excellent to revitalizing and nourishing the skin. It helps to soften the skin, reduce fine lines, acne and dark spots on the surface. I had almond pulp leftovers after extracting the milk and was wondering what to do with them instead of throwing them away. In my research, I discovered that I could use the pulp to make a facial scrub. Almond pulp contains antioxidants and vitamin E which can improve your skin tone. Almonds are very rich in antioxidants and vitamin E which helps to reduce the effects of free radicals on the skin. It helps to reduce and improve the appearance of acne, black spots, and wrinkle on the skin. Oatmeal is also rich in antioxidants too and helps to combat acne and inflammation. It is excellent for soothing most skin infections such as eczema and acne. Oatmeal also helps to remove too much oil and debris on your face. Honey has antibacterial properties which make it perfect for treating skin conditions. It is also rich in antioxidants just like almond and oatmeal. When these ingredients are combined, they help to reduce fine lines on the skin and any early signs of aging. 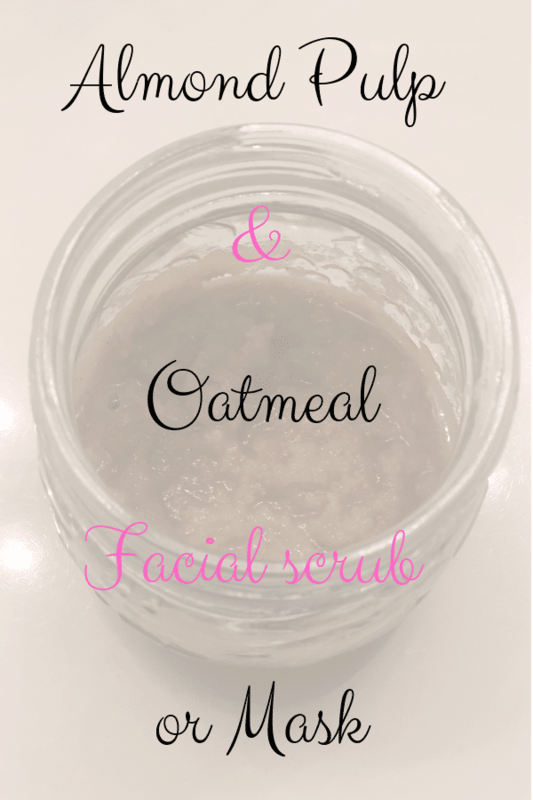 This almond pulp and oatmeal scrub help to exfoliate and clarify the skin. It helps to unclog and remove dirt beneath the skin pores. You can use it as a facial scrub as well as a mask. It is excellent for removing blackheads, healing acne and removing dark spots from the skin. Why I like this DIY facial scrub. I have tried other DIY facial scrubs, but none worked like this scrub. Most would take two weeks to a month to show results, and some did not work. The first time I used this scrub, my skin felt supple and radiant. After seven days I noticed a significant improvement on my face. My skin became much softer, lighter and the dark spots had started disappearing. By the end of one month, I only had very few spots left on my face. My friends started noticing and wanted to know what I was using. Some have tried the recipe and are very happy with the results. This scrub works great; you do not have to spend money on expensive scrubs anymore. In addition to that, it is very inexpensive and easy to make. You can get almond pulp from making almond milk, or you can use almond flour instead. The powder works well too. Give it a try, I believe you will like it. This almond pulp and oatmeal scrub are very gentle and soothing to the skin. It helps to reduce inflammation and itching on the face. It is great for both sensitive and acne prone skin. 4 Tbsp. Oatmeal flour or oatmeal powder. 1. Put all the ingredients in a clean bowl and combine well. Transfer the mixture to a clean glass jar with a seal and use it to exfoliate your skin daily for best results. 2. Store this facial scrub in your bathroom at room temperature. This batch can last for at least one week, but you can make more depending on how frequent you use it. Note. It is best for the old batch with a new one after every one or two weeks. 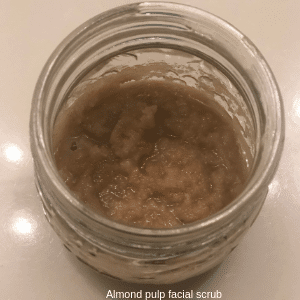 How to use this almond pulp and oatmeal scrub. Apply the scrub on your face and let it sit for five minutes. Rub your face gently in a circular motion then wash off the mask. Wash your face with a good facial cleansing soap and pat dry it. You can apply a skin toner and moisturize it with a good moisturizer thereafter. 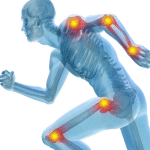 Previous Post: « 12 Worst foods for Diabetics people.